Every Mr. Steam brand order including a generator gets an additional discount, and we will not be undersold! Call (304-645-2310), E-mail or Live Chat to get pricing. The prices posted here are the lowest wholesale prices that the manufacturer allows legitimate authorized distributors to post. If you see lower prices posted elsewhere, they are not an authorized distributor, and you won't get the same support and warranty. sell these products, and you can't depend on proper support or warranty from them! additional discount, and we will not be undersold. Please call, e-mail or chat for details. This is just a sampling of Mr. 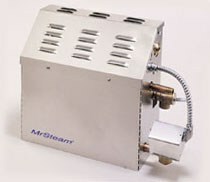 Steam products that are available for this generator. Details about the full range of Mr. Steam Residential products can be found here. Other generator controls are available, including designer finishes. Many other accessories are also available including aroma, sound, and lighting options.